With Thanksgiving rapidly approaching I knew it was time to let you in on one of my favorite tricks in the kitchen! Homemade chicken broth made in the slow cooker with the left overs from our rotisserie chicken! Pure genius! I have to admit this amazingness did not originate in my mind. I was taught how to make delicious homemade chicken broth by Lindsey of Homespun Sprout when she came to speak to our MOPS group. I was so intrigued with this after hearing her explain not only how easy it is to make, but how much better it is for you and how tasty it is, that I had to make it right away. Well two years later, I am here to tell you that this is a keeper! You won’t believe how easy and delicious it is! To make your chicken broth you will start with the left overs from your whole chicken. You can do this with any whole chicken, but we frequently have rotisserie chicken at our house fr dinner so I tend to use that most of the time. It just makes easy, even easier if that is even possible. I used to just toss these left overs in the trash but now I know what I treasure I had been discarding. 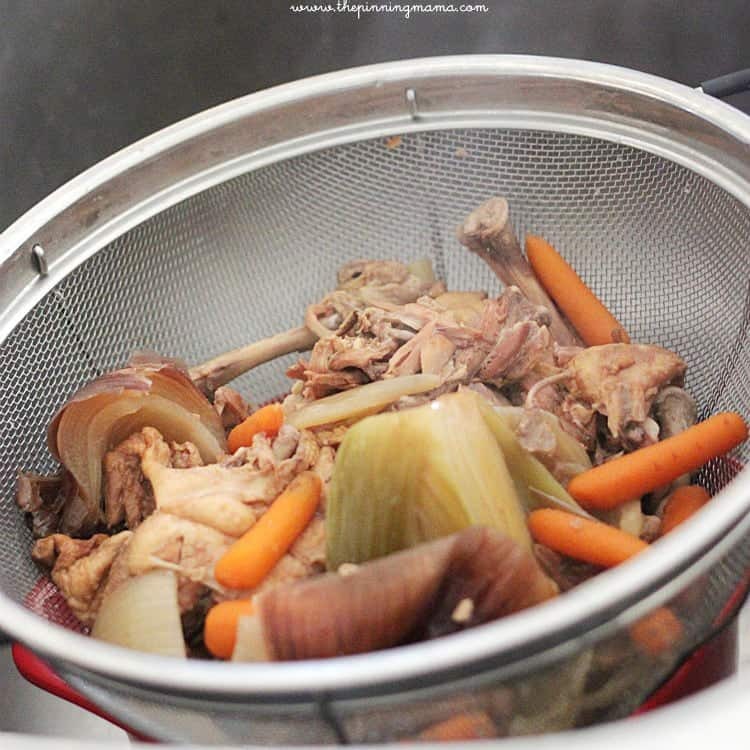 Place the left overs of your chicken into your crock pot. When I say leftovers I mean everything! Bones, skin, fat, id bits of meat. Just toss it on in. Top your chicken leftovers with any veggie leftovers you might have. I used onion, celery, baby carrots and a few garlic cloves. The veggies will also be thrown in whole. You will want to rinse off any dirt but throw in all stems, skins etc right with the chicken and veggies. It was hard for me to believe at first but it works people! After the meeting Lindsay spoke at, we actually jokingly called this trash broth since it seemed you just threw in all of your trash and cooked away! Ha! After you add your chicken and veggies you will just fill up the crockpot with water to the very top, covering all of your additions. Then put the top on and cook on low for 8-12 hours. Lindsay recommended after your meal you ate the chicken at just throwing everything right into the crock pot and letting it cook away all night while you sleep. This method has worked great for me! After the broth is finished cooking you will want to pour the contents of the slow cooker over a strainer into a bowl. For a clearer broth you can use a cheese cloth for this, but I just stick to what I have on hand which is a strainer. Now put your strained broth in the refrigerator for 4 hours to over night. 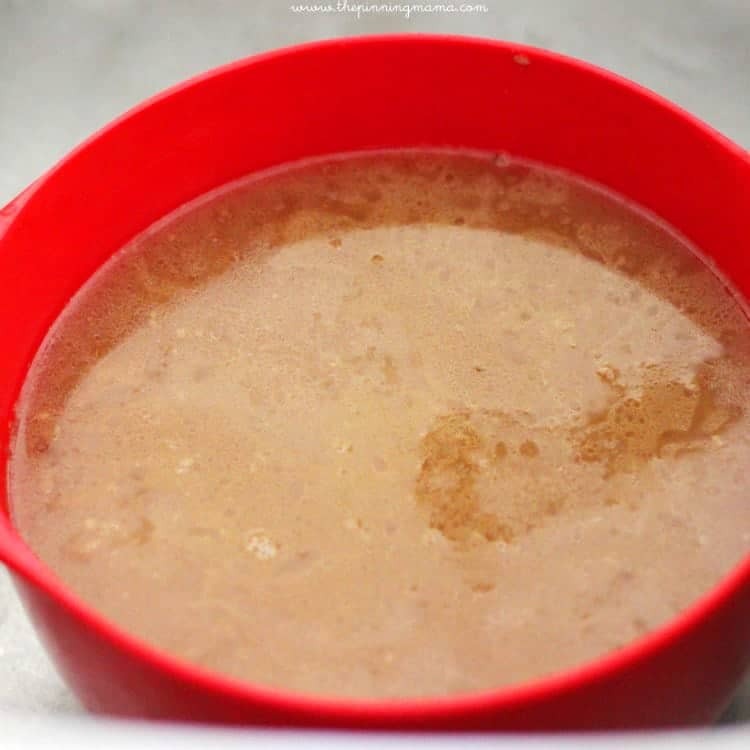 Once it is chilled the fat will solidify on the top and you can just use a spoon to scrape it right off and discard it. Your broth is now ready to be used or stored. I like to freeze mine in ziplock baggies in 2 cup portions since 2 cups is very close to the amount you would get in a store bought can. To do this I use a cup and put a baggie inside it flipping the top sides of the bag over the mouth of the cup to hold it open. I then use a cup measure to pour in two cups of broth. Remove the bag from the cup, seal, and repeat until all of the broth is packaged! I usually get 8 cups (4 bags) of broth out of each batch of broth I make. Isn’t it crazy? Out of my trash, I can make 4 cans worth of chicken broth! Blows my mind every time! This broth is easy, delicious, and frugal! Sounds like it might be the triple threat of the canned good world! Watch out! I hope you enjoy this delicious broth as much as I do! The possibilities for using it are really endless. With Thanksgiving coming up I am making and freezing a double batch so I have enough to use for every recipe I make with broth in it! Do you have a favorite recipe that uses broth? If you think this recipe is helpful, don’t forget to Pin it so you will have it saved for later! 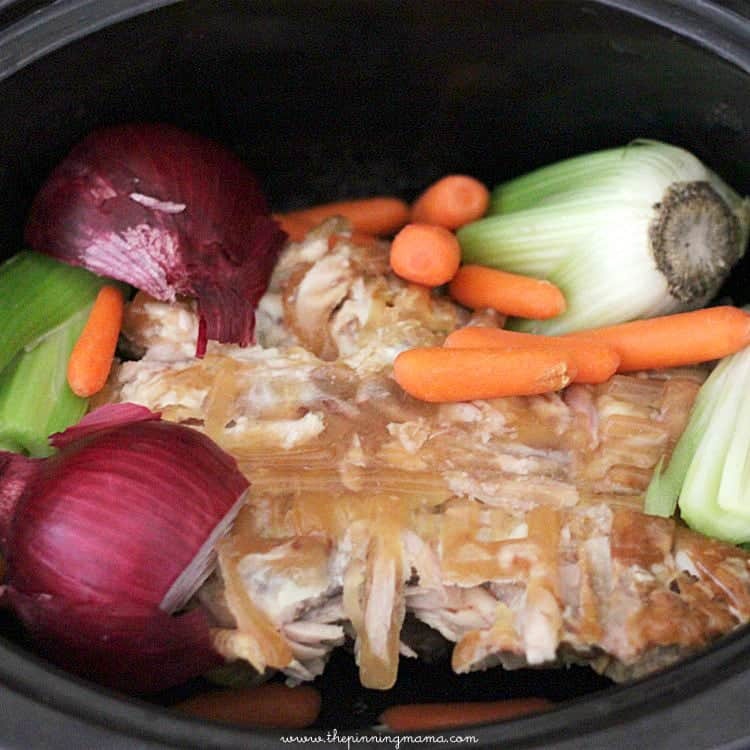 Add the chicken and vegetable remains to your crock pot. Cover the contents with water filling the slow cooker to the very top. Cook on low for 8-12 hours. Strain contents over a bowl. Place the strained broth into the refrigerator for 4-12 hours. Once chilled use a spoon to scrape off the fat that has risen to the top. Measure 2 cups of the broth into each ziplock bag. This should make 4 2 cup servings. Ohhh….this would be perfect to use for all of the upcoming meals this holiday season! Thanks Jen, I was hoping it was good timing! I’m so glad you shared this. I’ve really enjoyed how easy it is to make homemade broth. I know! Who would have thought you could use what I used to consider trash to make something I use as a staple in my house, and with no effort! Thanks for stopping by Kristin! God this looks good. It’s a rainy day here, and it makes me think of all the great things I could make with a delicious broth. I need big red onions like you had, for sure. Thanks Eli! It really is delicious and I enjoy having it on hand to make in whatever is being cooked up at the moment. I love onions (cooked) so I find a way to sneak them into most things 🙂 THanks for stopping by! 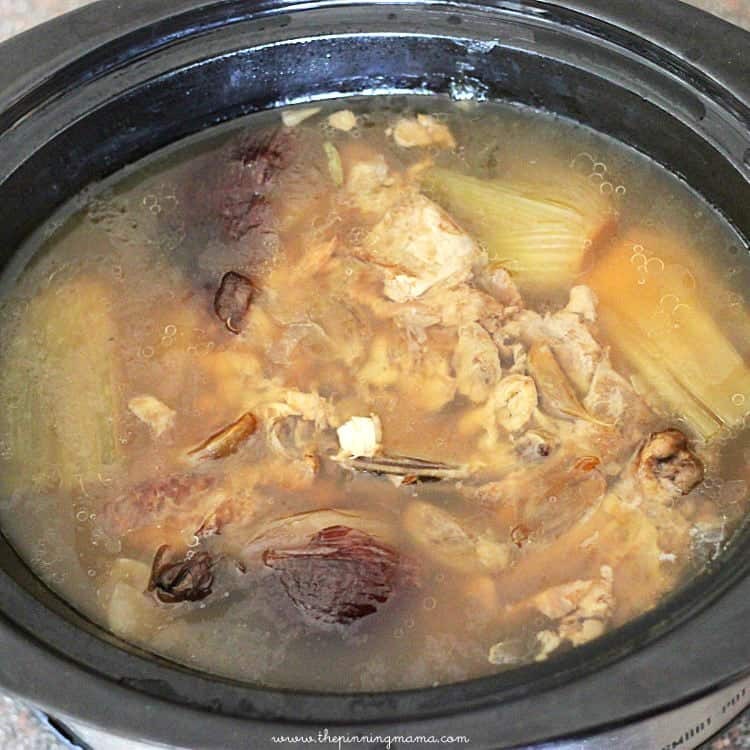 I never though to make chicken stock in a crockpot, makes you realize that you can really use the crockpot for more things than you would imagine. 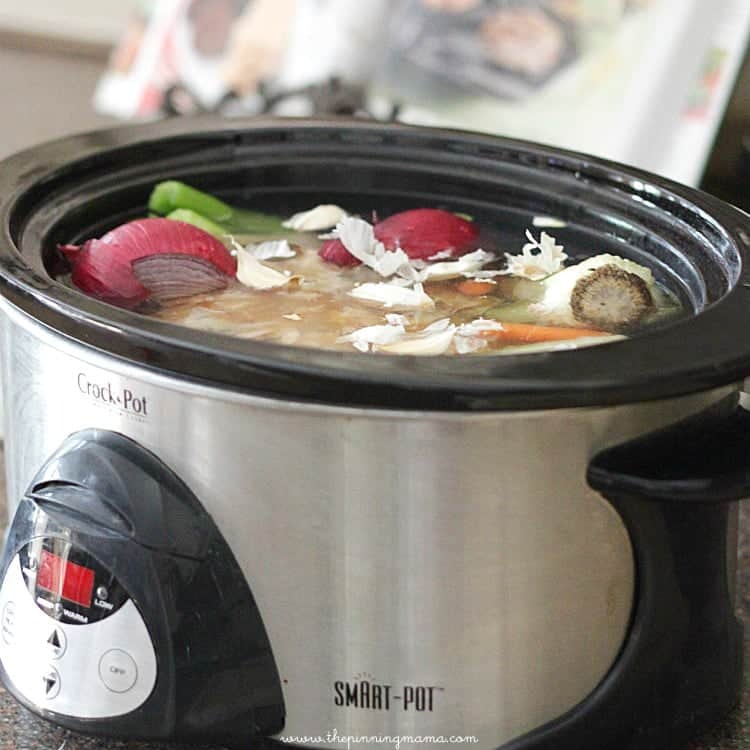 Christine, aren’t crock pots simply amazing! I am contantly in awe of what I see people do with them. One of the best kitchen inventions ever! 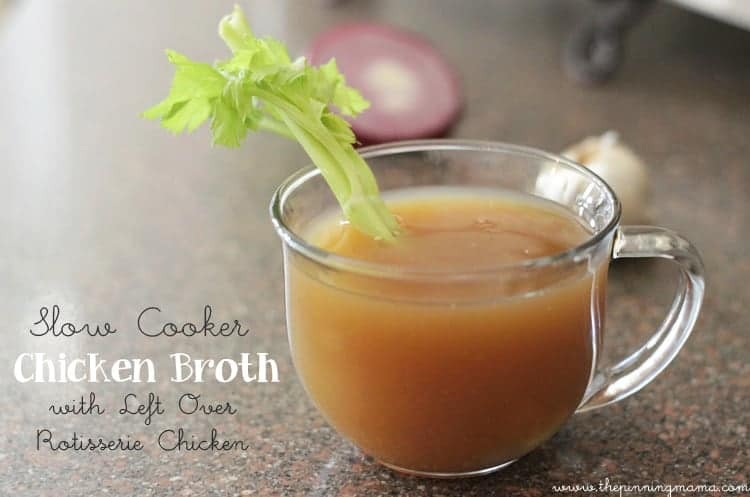 Don’t de-fat your chicken broth!!! Really! Use a fine strainer or chinois to get rid of the gunk, but let the fat stay. First of all, there’s not going to be that much fat left over – I bet if you measure it out, it’ll be 3-5 tablespoons at worst (best!). Second of all, you really want whatever fat’s left over for the soup…it’s going add to the flavor and texture. If you get rid of the fat, all you’ve got left is….hot chicken water. Sad. You are right Mark, it isn’t too much. I think it is great either way. I think the broth in general just has so much more flavor when it is made from scratch. Thanks for the tip! Yum! I love Lindsay’s method, too! I freeze mine in ice cube trays since I have some recipes that call for just a few ounces of chicken broth. Once frozen, I dump them all in to a gallon ziplock and throw them in the freezer. I may start feeezing one tray worth as 1 oz servings then freeze the rest in ziplocks – they take up a lot less room frozen flat in bags like yours! It made my day to see a comment from you Melissa! I love the tip about the ice cube tray! Thanks for leaving it! How long will the broth last in the freezer? Standard practice for freezer cooking is that it will last 6 months so I think that is a good guideline. I might have let it go a little longer from time to time and it has always been good! Hope that helps! 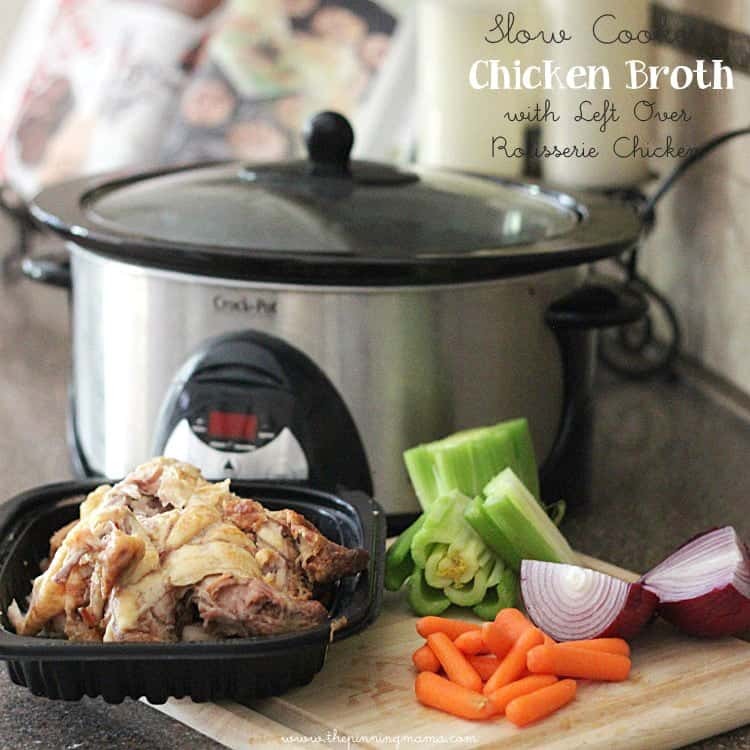 I have been making my own chicken broth for years…never thought of using the crockpot! I also save my veggies in the freezer to use in making broth. I use the ends of onions, carrots, garlic cloves, stems from kale, mushrooms, etc., in ziplocks in the freezer, then once a month or so I make fresh broth and freeze as you do. We buy a chicken every week too. I am doing this this week so that I have plenty for “soup season” . Another freezing method I use is first freeze the broth in a cupcake pan and when frozen transfer to a feezer bag. That is such a great idea! Thanks for sharing. Made this yesterday – came out great! Don’t know why I haven’t done this sooner. I have an 8 QT crock pot, which made tons of broth and the flavor is far superior to store bough (as expected). Genius! How many of us throw away all that goodness when we’ve purchased a rotisserie chicken!